Stock status is current as of 4/18/2019 1:07 PMET. Extend a VGA video and an RS232 data signal up to 300 meters (950 feet) using Cat5 cabling. 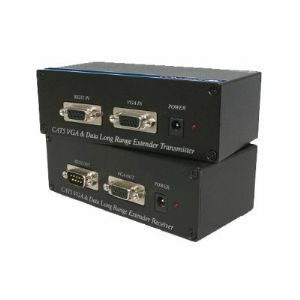 This VGA over Cat 5 Video Extender extends VGA video and RS-232 data signals over cost effective CAT5 cable instead of bulky VGA and serial cable. Comprised of a transmitter and receiver unit, the VGA and RS-232 extender is ideal for home or commercial applications as a smart, fast and cost-effective VGA extension solution. Now, you can broadcast video and control a projector or any other RS-232 devices from a single remote location, making this extender the perfect solution for touch screen or auto control equipment applications.